Kenya Rugby sevens team beat Scotland to proceed to the Hong Kong Sevens Semi finals where they will meet New Zealand at the ongoing Hong Kong Sevens. Kenya Rugby Seven’s team on Sunday morning advanced to the semi finals of the Hong Kong Sevens after defeating Scotland 19-12. The boys will now face New Zealand in the semis at 11:30AM, this becoming their second semi finals match in a row. Willy Ambaka opened the scoring for Kenya in the second minute with Sammy Oliech duly converting to make it 7-0.Jamie Fandale responded for Scotland in similar fashion and Ruaridh Jackson successfully converted. 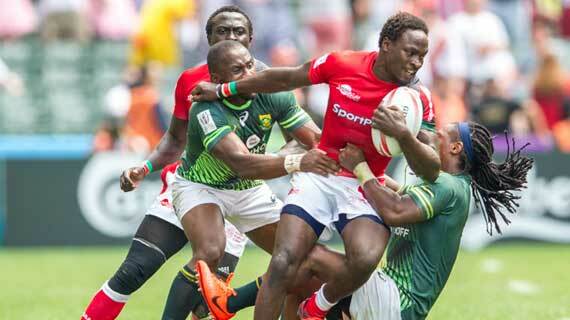 Oscar Ouma got another try for Kenya with Oliech converting again to give Kenya a 12-7 half time lead. The Scots wouldn’t go down that easily so they piled pressure that paid off with another try and conversion by Jamie Fandale and Ruaridh Jackson respectively. Jeffery Oluoch came to Shujaa's rescue deep in the second half with a try that Sammy Oliech converted to give Kenya a 19-12 win. New Zealand defeated USA 35-07 in the other cup quarters to set date with Kenya. In other Cup quarters South Africa humbled Spain 35-5 and will meet Fiji who beat Argentina 40-14.